At the age of 56, I had received a bronze-handshake severance package from General Electric after 30 years of service. My wife Marion and I decided that I would not go back to work immediately. Instead, we would take a break, and live and work overseas for a couple of years. The first year we lived in South Korea, where Marion taught English full-time. I taught part-time, volunteered at the Korea Anabaptist Center, and played ice hockey with a group of Canadians, Americans and Koreans. From there we embarked on an eight-month backpacking tour of Australia, New Zealand, Singapore, Indonesia, Vietnam, Cambodia, Thailand, Myanmar, Laos, Mongolia and Russia. That is how we came to be in Australia for Christmas 2002, away from family and friends. Marion and I were discussing our mutual Dutch/Germanic heritage with our newly found friends, Lex Evers and Dora Twikler of the Netherlands. I mentioned that my people, the Mennonites, had taken the culinary Christmas tradition of peppernuts with them when they left Friesland in the 16th century. Dora found it difficult to comprehend how this tradition had been carried through Eastern Europe and on to North America over a period of almost 500 years. She marvelled at my German pronunciation, still almost identical to hers. How could this be after all those years? The history of Pfeffernusse (literally translated as peppernuts) is not well documented. Many Dutch Germans simply say that the recipe is from Oma’s Zeit (the time of our grandmother). Peppernuts are a special kind of Lebkuchen or German gingerbread. The making of gingerbread in Germany, is a hallowed process; it’s a tradition taken seriously. As early as 1643, strict rules authorized only certain bakers to make and sell gingerbread. The name refers to the cookies’ hard texture and nut-like size and shape. It also refers to the Pfefferlander, the spice-rich countries of the east that supplied the more exotic ingredients for this delectable little biscuit. Peppernuts and wheat are two traditional Christmas foods Marion and I have brought together from our distinct family backgrounds. Peppernuts come from my Russian Mennonite culture, and wheat boiled with poppy seeds mixed with walnuts, sugar and cream comes from Marion’s Austrian Catholic heritage. 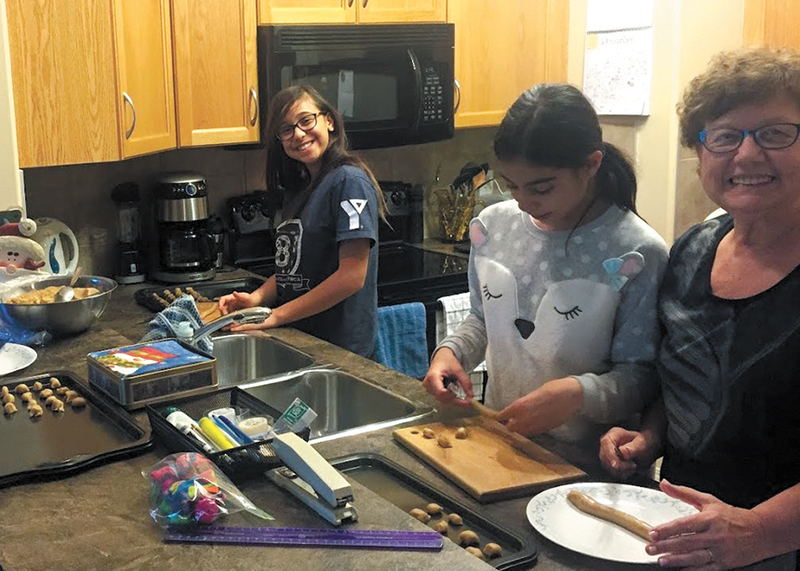 Making peppernuts every year is a big part of our Christmas celebrations with our children and grandchildren Kishina, Anaya, Zachary and Nathan. The warm glow from the hearth, Christmas lights, muted conversation, card and board games, and peppernuts and wheat for dessert make for a perfect family celebration. We always share a small, brightly wrapped container or bag of peppernuts with family and friends who come to visit, and we take a bowl full of them to the church family Christmas banquet. We’re happy to share our family peppernut recipe with you as well! May you enjoy this recipe as much as our family has throughout the generations—and don’t forget to bake them with love till golden brown. The recipe is available online at canadianmennonite.org/stories/omas-peppernuts.